Sorry I didn’t post yesterday. I fell asleep! Here’s a new post. There they stood — Ghost Trees. And up the opposite hills. Looking like a porcupine’s back. Barkless and denuded of vegetation. Between swatches of dead gray. 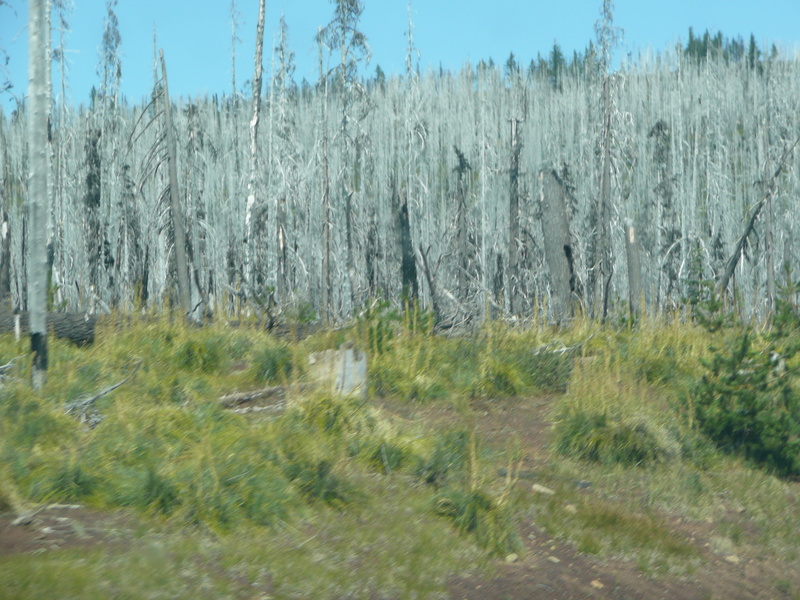 By the time you’ve reached Suttle Lake. On we go, down and up,. Their tan bark marbled with dark lines. 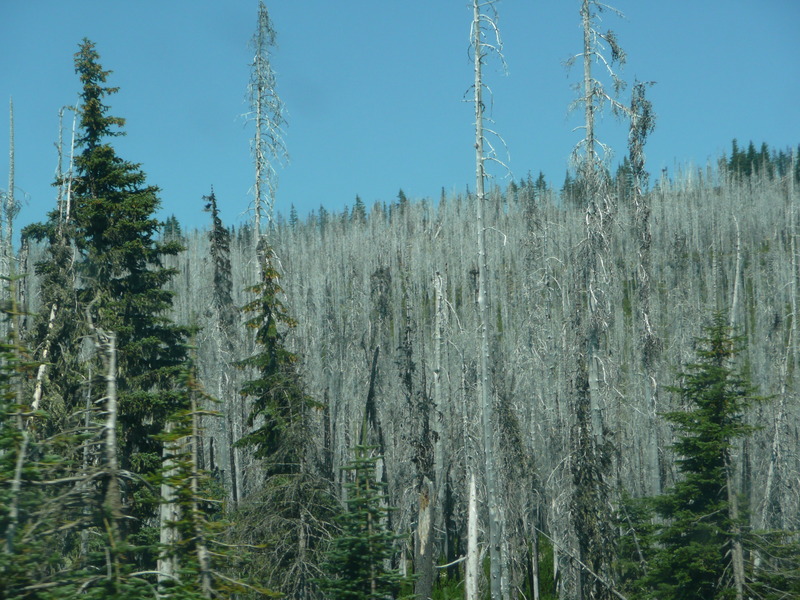 This entry was posted in Scenery Descriptions & People I met, Travel and tagged Black Ribbon Highway, Blue Lake, Ghost Trees, Oregon Cascades, Pinus ponderosa, Ponderosa Pine, Suttle Lake, United States, United States Forest Service, Vanilla, Wildfire. Bookmark the permalink. Carol, I already replied to this by e-mail but want to add that I really enjoy your blog and hope for a great crossover from the link on my blog. Regarding the poem: I wasn’t sure it was a poem either but a friend of mine who has been published and also teaches poetry assured me it was. I hope to get pictures of the two lakes I wrote about and repost the blog. If you were waiting for a response, I haven’t seen any e-mail from you, so you might want to resent it. Funny. I can’t find it either. It’s not under “Drafts” or anywhere else. Can’t remember what I said except maybe that I’m honored you’re still following my blog and I hope people are connecting to yours from the link on my blog page. Regarding the smell of Ponderosa pines: some people think it smells more like bubble gum. Regarding the “sapphire” lake: If there is room along the highway I’m hoping to pull over and take pictures of the lake(s). If I can I’ll repost the blog with the pictures. p.s. How was the writers’ conference? The conference I registered for doesn’t happen until mid October. I just like to get such details out of the way early. I don’t know how you do it..sleep is good. the poem….It’s the colours and the passing smells that we remember…it is a poem no doubt:) I can remember my first smell of pine..always! Eleanor, I’m glad you liked “Forest Ghosts…” A forest ranger encouraged my children to smell the Ponderosa pines to determine their smell, if they had one. I couldn’t resist smelling along with them. A delightful aroma. Regarding sleep: I don’t have to get up to go to work and I have a very understanding hubby. He lets me sleep in the morning. p.s. I’m glad you’re so supportive of parents!